Eric LaPerna has been a performing musician for over 25 years. He is well versed in many different styles of percussion but Middle Eastern hand drums and rhythmic systems are his specialty. He is a founding member of Okbari Middle Eastern Ensemble and Zapion and has played with some of Maine’s most prestigious ensembles and performers including the Daponte String Quartet and the late Udi Alan Shavarsh Bardezbanian. Eric is the Director of the Bowdoin College Middle Eastern Music Ensemble, and is a member of the Applied Music Faculty at Bates College as well as adjunct instructor of hand percussion at Bowdoin College. 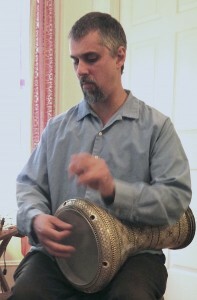 He also teaches private lessons and workshops on Middle Eastern hand drums and music throughout New England.